Welcome to Handmade Originals by April Cummins. This Post Card look, Santa Claus is dressed in heavy fabric trimmed with fur. His pants are red white stripe thin stripe trimmed with fur. He is carrying an Antique quilt bag filled with my hand sculpted, hand painted vintage look christmas toys. He has a christmas tree attached over his shoulder. 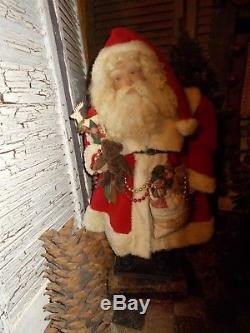 Mr Claus has a vintage flocked deer a primitive bear and another cluster of vintage look toys which I have hand painted one at a time and a garland of christmas ornaments. Santas face , fingers are hand sculpted and hand painted one at a time. His beard is real curly lambs wool. His arms are wired to pose. He stands aprox 24 inches. This santa will make a wonderful Addition to your Olde Fashioned Christmas Holiday. 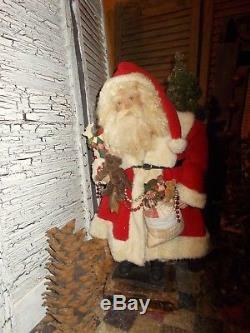 The item "Primitive Santa Claus, Vintage deer, Antique christmas ornaments, HANDMADE" is in sale since Tuesday, November 13, 2018.